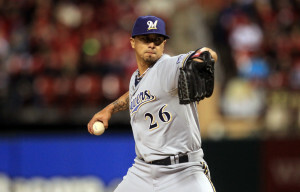 Yovani Gallardo continued his recent success, pitching seven strong innings in a 3-1 Brewers victory over the Chicago Cubs at Wrigley Field. Gallardo allowed 1-run on 3-hits, improving to 11-9 on the season. He is 3-0 with a 1.35 ERA in five starts since coming back from a hamstring injury that put him on the disabled list. The last time Gallardo took the mound at Wrigley Field, he had to leave with a tight left hamstring injury. The Cubs scored their only run on a Junior Lake home run in the 5th inning. Jeff Bianchi came on as a pinch hitter for Scooter Gennett in the 7th to drive in two of the Brewers three runs. The Brewers (62-80) are off today, their final off day of the season. They’ll travel to St. Louis for three against the Cardinals on Tuesday night before a long 10-game home stand to follow. The Brewers bats woke up in the top of the 9th Monday at Wrigley Field as Milwaukee notched a 5-0 win over the Chicago Cubs. Playing in a ballpark that doesn’t surrender too many home runs, the Milwaukee Brewers got a pair of long balls in a 8-4 win over Miami at Marlins Park. Two players not known for their long ball prowess, ripped shots to give the Brewers their 12th win in the last 15 games. The Brewers remained 7 1/2 games out of the second wild-card spot in the National League with 7-games left to play. Norichika Aoki and Jeff Bianchi both hit home runs and drove in three runs for the Brewers and Ryan Braun drove in a pair of runs to give him 98 for the season. Two more for Braun and he’ll hit 100 rbi’s for a fifth consecutive season. Kameron Loe gets the win and John Axford earned his 24th save for the Brewers. Game 3 of the 4-game series is tonight. Right handed pitcher Wily Peralta, one of four players called up on Tuesday, will make his first major league start tonight for the Brewers. Ryan Braun hit his National League leading 37th home run to lead the Milwaukee Brewers to a 12-8 win and a sweep of the Pittsburgh Pirates at Miller Park on Sunday. Yovani Gallardo struggled on the mound and didn’t last long enough to secure the victory for the Brewers, but he did hit a home run. The Brewers tied a season high with five homers in all. Jeff Bianchi, Rickie Weeks and Carlos Gomez also joined the home run parade.